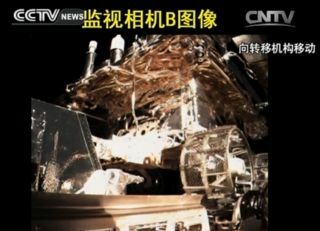 A camera on China's Chang'e lunar lander shows the Yutu rover in its carrier just before deployment to the lunar surface on Dec. 14, 2013. Last week China's first moon lander Chang'e 3 carrying the Yutu rover successfully touched down on the lunar surface, scientists declared Comet ISON dead after its highly anticipated solar flyby, and scientists detected signs of a water plume on Jupiter's icy moon Europa. See the best stories from last week here. Nature Geoscience | Alfred McEwen et al.